See an excellent article in the Caribbean Compass by Don Street. Trinidad is a safer place to stay. Many of the tropical storms that have tracked over or near Trinidad were early in their development and thus relativly weak. History of Hurricanes in Trinidad and Tobago. 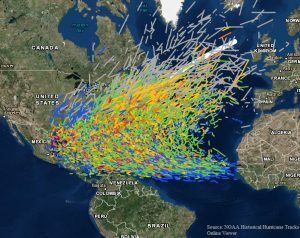 Hurricane Tracks for the last 150 Years. June 1933 Storm - On June 27 1933 Trinidad was the scene of much destruction due to the infamous ‘Hurricane of 1933’. This was a time before they started naming hurricanes in the manner we are accustomed to today. Reports indicate that the storm formed on June 24 1933 before destroying south Trinidad on the 27th. Other hurricanes that passed over or near Trinidad: Alma (1974), Fran(1990), Bret (1993), Isidore(2002), and Bret(2017). And Tobago: Flora(1963), Arthur (1990), Joyce(2000). The only storm that caused any significant damage or loss of life was the 1933 storm. The handful of storms that have affected Trinidad formed unusually far south in the Atlantic and managed to track directly west. This rare combination is the reason Trinidad is said to lie south of the hurricane belt. The marina area in Chaguaramas is well protected by land to the North, East, and much of the South. It is open to the Southwest to the West. Strong winds from the West can set up a short chop affecting boats at anchor on in the water in marinas. Boats in the water would need to make arrangements to either move further south or haul prior to a storm that will track just north of Trinidad (providing west winds after the eye passes north of Chaguaramas). Boats on the hard are safe and marinas are prepaered to add tie-downs in case of a storm. Captains planning to leave their boats in Chaguaramas should work with the marinas to assure that there is a clear understanding on who will do what. 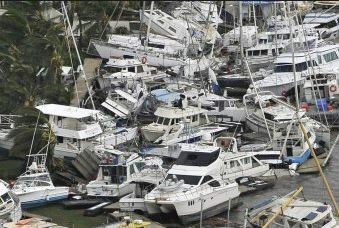 Most insurance companies issuing policies to boaters in the Eastern Caribbean define a "huricane box". Within this box the policies provide higher deductables or less coverage - none in some cases. The south edge of this box is north of Chaguaramas for most companies. Grenada (even the south coast) is included in the box of most companies now. Check your own policy. Hurricane Ivan in Grenada, The horror we all wish to avoid. A true life article of how a cruiser lived through a hurricane, from Passagemaker Mag. ODPM Guide The Office of Defense Preparedness and Management has an excellent guide on huricane Preparedness. Get South - Everyone has a different level of comfort. Some elect to go south to Trinidad early (before the end of June), others wait till the Atlantic Storm Season begins in August to head south. Make your reservations early as the yards and marinas tend to fill up. Make a Plan - While a huricane is unlikly, a plan is needed. There is usually enough warning to allow boats in the water to be hauled. Boats on the hard need to make plans to secure the boat. While, it is possible to sail south to various mangrove forests in Trinidad, the political situation in Venezuela makes the mouth of the Orinoco a poor choice at the moment. Sit Back, Relax and Enjoy Trinidad. Copyright: 2018 YSATT, All rights reserved.